Panajachel is Lake Atitlán’s most popular traveler town. Set along the northern shores of the lake, the setting is here is gorgeous—think blue water, forested mountains, and volcanoes. The town’s culture mixes North American, European and Central American influences. Panajachel was one of Central America’s main hippie hotspots during the 1960s and 1970s. Over time it has integrated into Guatemala’s mainstream tourism circuit, and these days is popular with Westerners and Guatemalans alike. Prior to the arrival of travelers, Panajachel was a small Mayan village. Early in the Spanish conquest, Franciscans had a church and monastery in Panajachel—from here they launched regional conversion campaigns in other indigenous villages. Most of the old village is gone these days, having been taken over by fairly nondescript buildings. The setting here is spectacular enough. 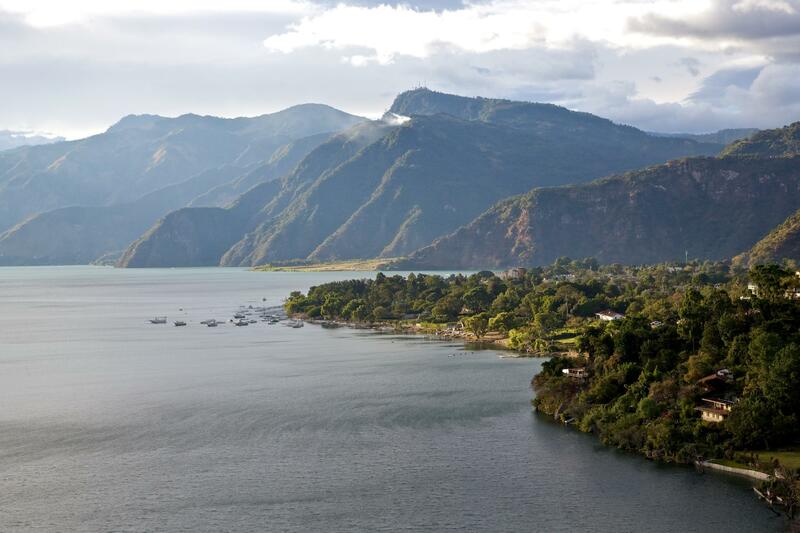 Pana, as locals know it, is one of the most developed towns along Lake Atitlán. It has good accommodations, some of which are set just outside town, and a smattering of tasty restaurants. There are garden cafés where you can enjoy fresh fruit smoothies, as well as upscale options that serve excellent international cuisine. Pana is also a great place to shop for handicrafts. Stalls line Calle Santander, the town’s main street, and sell all manner of goods. Bargaining is encouraged. During the weekends, residents of Guatemala City make their way to Pana to party. Appropriately, the city has a fair share of bars and dance floors. Some places have mellow bohemian atmospheres, while others host live bands and turned-up dance parties. The Reserva Natural Atitlán is located just outside town. 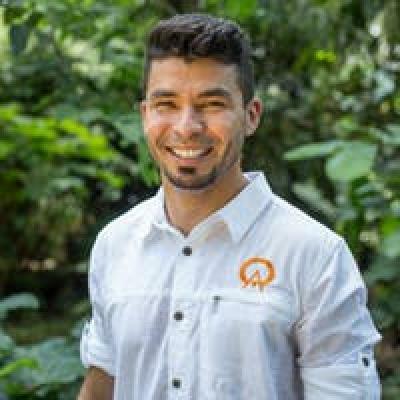 Set on a former coffee farm, this nature reserve offers travelers a number of attractions, including a butterfly farm, zip line, lakeside beach, waterfalls, nature trails, and hanging bridges. The trails here run through thick foliage and offer the possibility to spot monkeys and small mammals. The lake and surrounding hillsides offer up all kinds of recreational activities. Pana’s public beach is fairly clean and fine for swimming. Kayaks can be rented and paddled out into the lake—try to avoid doing so in the late afternoon, when the winds known locally as Xocomil come blowing in. Hiking trips can be arranged to the San Pedro Volcano or in the mountains surrounding town. Going with a guide is definitely recommended. Mountain biking, rock climbing, and rappelling can also be arranged. "Lake Atitlan was very beautiful & touristy. The place was very safe and one can walk around late at night not being hassled. Lovely restaurants and the food was great. Locals were very friendly and when ever we were stuck of needed to find a place the locals would kindly assist. Our hotel was very beautiful just in front of lake Atitlan. " Lake Atitlan was very beautiful & touristy. The place was very safe and one can walk around late at night not being hassled. Lovely restaurants and the food was great. Locals were very friendly and when ever we were stuck of needed to find a place the locals would kindly assist. Our hotel was very beautiful just in front of lake Atitlan. Cultural guides, scenic tours and hotel accommodations were world class. Again a bit of captive audience with shopping and presentation of artisans and locations. We loved and may plan a trip back becuase we did not have enough time. We stayed 2 nights but should have stayed as least 3. When planning trips should suggest they spend 3 nights. We had lunch twice at a large hotel/restaurant right on the lake in Panajachel, simple, delicious, well prepared food with great service. The site did not have that many tourist at the time I was there. The gift shops were kept a nice distance away from the structures,the guide was very good. Not enough time to, possibly a full day or two. Very impressive.